Steph, first started working with Horses some 35 yrs ago, Her love of Dressage Training and competing, have been her way of life, to this end the icing on the cake was to be asked to compete for GB in 1993 with her horse T C WILLIAMS, Both of them were a force to be reckoned with over a number of years at Grand Prix. Steph also turned her talent to Judging and today is a BD list one judge. When not judging or training she has her own horse Hexenmeister which is graded advanced medium. 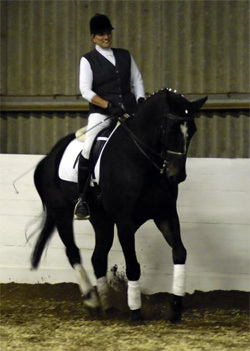 In the last 8yrs Steph as trained 8 of her own horses to advanced level, during the winter months Steph often gives Demos, the high light of the evening is a music section which is always entertaining. Steph always gets great pleasure, hearing from her clients as to how well they do at competitions and when they win you would think she had won.Steph has a direct approach but delivers her coach with a sense of fun and oozes enthusiasm which is infectious! 6 Riders required to run this event.